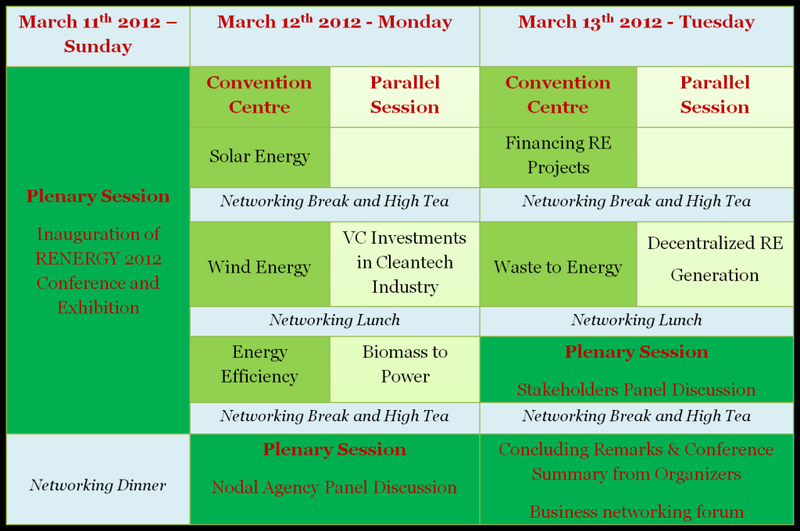 ”RENERGY 2012”, an International Conference and expo on Renewable Energy would be held here from March 12 and 13. More than 5,000 visitors were expected to attend this India’s largest International Conference and Expo on Renewable Energy, to be organised with the support of Tamil Nadu Energy Development Agency (TEDA). The event is aimed at bringing together the state-of-the-art renewable energy technologies from across the world, green field ventures, latest innovation on a single platform, with an objective to provide a clear picture about the current trend in renewable energy sector. RENERGY 2012 would be a resourceful avenue to encourage investments in the renewable energy sector. ”It also provides a holistic sector-wise growth across all regions of the state”, an official release here said. The event, focused on business-to-business transactions, provides an opportunity for businesses and delegates to know the latest advancements in the field and meet industry professionals and experts, the release added. Posted on February 7, 2012, in Events and tagged chennai, chennai trade center, international conference, international exhibition, renergy 2012, Renewable Energy. Bookmark the permalink. 2 Comments. Hi, Now you can post your article in audio format at http://www.myaudibles.com, Send your articles in document format to myaudibles@gmail.com. We convert your articles in to audio format and publish it in myaudibles.com site for free.